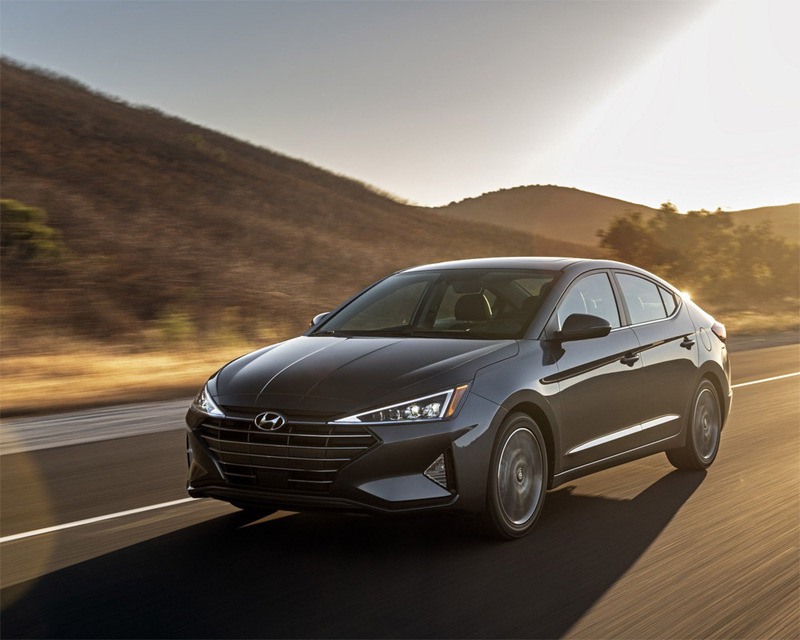 The all-new 2019 Hyundai Elantra Facelift has been revealed but the buzz around it has refused to slow down. Everyone has been curious about the Elantra facelift since the camouflaged model was spotted testing for the first time in South Korea in May 2018. The mid-life cycle upgrade is a great example of how to make a good thing better. The new Elantra has now a sharper look and a longer equipment list. The new design update will provide the Elantra with an edge to keep the fight more fiercely against segment competitors like Toyota Corolla, Skoda Octavia and the upcoming Honda Civic. Updated Elantra’s sports a repositioned LED daytime running lights cluster, single streak and cascade grille among other features. The obvious and most plausible changes include the use of LED to construct a more dynamic design. The boot-lid has also received changes with the number plate recess now moving to the rear bumper. While the base variant is available with 16’’ wheels, top end variants are offered in a choice of 17’’ or 18’’ wheels. The infotainment system has also been upgraded. The front fascia, fenders, grille and headlamps are noticeably distinct. The 2019 Elantra is powered by a 2.0L engine that can deliver 147 hp. The engine can be paired with a 6-speed manual or 6-speed automatic transmission. The standard 6-speed manual transmission includes an EcoShift indicator that identifies ideal shifting points to help you save fuel. On the other hand, the available 6-speed automatic features SHIFTRONIC manual shift mode for an engaging driving experience. Easy tuning of key suspension components helps reach a balance between controlled handling and ride comfort. The available Drive Mode Select feature allows the driver to adjust both throttle response and steering effort to match the preferred driving style. You can select one of the available modes by simply touching a button on the centre console. Hyundai Elantra offers a redesigned cabin which is more spacious than the outgoing model. The enhanced ergonomic layout of the centre console controls works well with the sporty checkered design of the gauge cluster. The heated seats keep the driver and passengers comfortable. The new Elantra also has dual-zone automatic climate control settings. It allows both driver and front passenger to select their own climate settings for optimal comfort. The car also comes with a premium audio system. Elantra’s revised structure not only delivers enhanced safety but it also offers a stronger and stiffer frame. As a result, key suspension components can be tuned more precisely to reach a balance between handling and ride comfort. The all-new sporty grille design gives it a more road presence. Beside LED headlights and taillights the sleek design of the available LED side repeaters not only look good but also provide added visibility while taking a corner. The Luxury and Ultimate models come with 17’’ alloy wheels. The hands-free smart trunk makes loading and unloading ups Elantra’s utility factor. The power sunroof adds to glory and makes the cabin a wide and airy. Elantra comes with a decent choice of colours with availability ranging from space black and intense blue to platinum silver and polar white. The new Elantra comes with a suite of available Hyundai SmartSense safety technologies. The body is built using advanced high strength steel to deliver exceptional strength. The available Parking Distance Warning sensors come in handy in tight spaces and while reversing. The Blind-Spot Collision Warning used radar to detect when a vehicle is in your blind spot and allows you to easily change lanes. Other prominent smart safety features include Rear Cross-Traffic Collision Warning, Lane Departure Warning with Lane Keeping Assist, Forward Collision-Avoidance Assist with Pedestrian Detection, Driver Attention Warning and Adaptive Cruise Control.